Home / animation / articles / Featured / web animation / web animation watch / Web Animation Watch: 'Alike', 'Hi-Lights' and more. 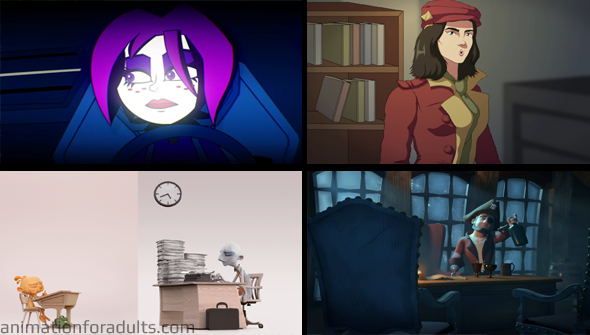 Web Animation Watch: 'Alike', 'Hi-Lights' and more. The internet has enabled animators to get their stuff out there easier than ever before. But with such a veritable ocean of content, how are you supposed to know what is worth watching? That's where we come in. Welcome to the very first Web Animation Watch of 2017! If you have made (or found) something that you think would be at home in a future edition, please drop us a line. If you've been following WAW for a while, you already know we love Weebl's Stuff. Out of many fantastic creations to come out of the mind of Jonti Picking (aka Weebl) virtual electro-pop band Savlonic stands out as something rather different. While the band may be virtual, the music is the real deal- and they are usually accompanied by fantastic videos. The latest release from their successfully kickstarted Neon album is this track Hi-Lights, which comes complete with this stylish video. We're big fans of Mashed here at Web Animation Watch, so it was great to see them put out their very own answer to YouTube's annual Rewind video. Take a look back at the excellent stuff they put out during 2016 thanks to some of the foremost talents in web animation. Here's to another year of great stuff from them in 2017! Contains adult humour. A pirate captain is haunted by the mischevious ghosts of his lost body parts in this inspired nautical-flavoured CG short from Shabnam Shams, Megan Robinso and, Sara Chantland. Yarr! Alike is a thoroughly charming CG short about the different approaches that a father and son take to dealing with everyday grind of life ( and the pressures of work and school, respectively). Featuring a lovely style that's pretty reminiscent of stop-motion and a simple but effective story, it's well worth your time. Directed by Daniel Martínez Lara and Rafa Cano Méndez.